A few years ago, Dr G and I visited Malaysia, and stayed at two properties of the YTL group, reputedly the country’s number one hotel collection. High up in the mountains among tea plantations, we spent a couple of nights at the colonial-style Cameron Highlands Resort, having one of our most interesting stays whilst in Malaysia (reviewed here). On the same trip, we also visited Pangkor Laut, Malaysia’s top resort, also owned by YTL (reviewed here). These experiences were breathtaking, and the YTL has since that time become one of my favourite Asian hotel collections. Whenever I travel to the region, I look out for their properties. More recently we stayed at The Surin, a luxury resort in Phuket, Thailand (also reviewed here). Currently the collection extends beyond Malaysia and Thailand to a number of other countries including Indonesia and Japan, and they also own The Gainsborough Spa Hotel in Bath, England. We had such a wonderful time at Pangkor Laut that, when I was invited by the YTL group to Malaysia for a return visit to the resort, I didn’t think twice. I was also given the opportunity to spend an evening at The Majestic Hotel Kuala Lumpur, which certainly lives up to its name, being one of the most elegant hotels I have stayed at and the only one in KL to be included in the prestigious Leading Hotels of the World luxury collection. The Majestic Hotel Kuala Lumpur includes the original Hotel Majestic, which is a national heritage site. This colonial building dates back to 1932 and became an iconic hotel of its time. A symbol of Malaya’s boom years before World War II, the hotel was the destination for glamorous social events, government receptions and the hotel of choice for prominent international visitors. Today the hotel is part of the YTL’s Classic Hotel group, having been restored to its former glory and extended, and renamed The Majestic Hotel Kuala Lumpur. The hotel is spread over two wings – the Majestic and the Tower. The Majestic Wing is the original historic hotel building, and I stayed in one of the suites in this lovely part of the hotel. All the Majestic Wing suites are provided with 24-hour butler service, WiFi, and a complimentary, fully stocked minibar, in-room continental breakfast and a pick-up and drop-off service in Kuala Lumpur city centre, which I found very handy when sightseeing. My room was a magnificent Art Deco suite, so large and so elegantly furnished, it was truly palatial. Annexed to the Majestic Wing, The Tower Wing is a modern addition, housing the majority of the hotel’s guestrooms and suites, and this is also where the hotel’s largest restaurant Contango is found, as well as the conference centre, the gym and fitness centre, and the largest of the hotel’s swimming pools. The hotel has six different locations where guests can dine. On our first night we headed to Contango. I enjoyed our dinner here for various reasons – the food offering was excellent, particularly the Malay and curry spreads, but it was the variety of cuisine choices and the buzz of the place that really sold it to me. Contango is among the finest food courts you will come across in KL with open plan kitchen stations offering everything from Brazilian churrasco to pizza and Japanese sushi, as well as Malay and Nyonya cooking. The place was heaving on the evening we were there, with a predominantly Malaysian clientele; it sits up to 250 diners. I must admit that I had never used a hotel gym before my stay at the Majestic Hotel. Having just paid a small fortune to join a local gym back in London, I decided to get up early (making the most of my jetlag), and work the treadmill. The gym facilities are excellent at the hotel with all the amenities one might want, including a gorgeous swimming pool with spectacular views over the city. Breakfast is also taken at Contango, and just like at dinner, the offering was a true feast. There were stations of Malay breakfast serving Nasi Lemak (coconut rice with egg, sambal sauce, dried anchovies, cucumber and peanuts wrapped in banana leaf), roti canai (flaked pastry served with chicken curry or sweetened with condensed milk) and other local delicacies. I love congee - a savoury rice porridge that is a traditional Chinese breakfast, whenever I am in Asia, and the Chinese congee station at Contango was again superb. The breakfast at the Majestic Hotel is a real foodie experience, so if you are staying at this hotel make sure to get up in time for it, take your time and enjoy it in a leisurely fashion. In a hectic city like KL, The Majestic Hotel’s spa is an oasis of calm and relaxation and I was lucky enough to enjoy a 90-minute Malay massage there, after which I was walking on clouds. There are several treatments that guests can book and I highly recommend one during your stay. Malaysia and other Asian countries have a long tradition of massage - not only for relaxation but also as part of a holistic treatment for many ailments. Whatever your reason, I cannot think of a better way to start (or end) your holiday in Asia. Residents of the Majestic Wing are afforded the luxury of a pick up and drop off service to the city centre of KL. Keen to hit the town, I was taken by limousine to an agreed spot and given a mobile phone to call the hotel whenever I wanted to be picked up. I had a quick but enjoyable whizz around the Central Market, Jalan Petaling and the busy neighbouring streets of KL. I have been to the city a few times but I still find it impossibly difficult to navigate – this is partially down to my own lack of spatial awareness and my reliance on Dr G doing all the navigating whenever we are travelling together, but as I was on my own I found the chauffeur service a great comfort. I don’t need much to work up an appetite but all that walking certainly helped. I was intrigued by the Colonial Café, and particularly by the food being served there. Colonial cuisine, I learnt referred to the cooking of Chinese chefs created during the time when the British ruled Malaysia and Singapore (known as British Malaya) between the 18th and 20th centuries. The British officers and merchants positioned there at the time, and who were wealthy enough to afford cooks, longed for some of their native dishes. Colonial cuisine was hence born from the attempts of these Chinese chefs to recreate such dishes using British staples, Asian cooking styles and some exotic local flavours. I thoroughly enjoyed our lunch at Colonial Café - it was refreshing to see a creative approach to some classic British dishes but the quality of ingredients and the level of cooking skills were also top notch. One of my favourite dishes was the baked seafood crab shell – this was a mixture of crabmeat, fish and other seafood mixed with seasoned breadcrumbs and served with a gorgeously cheesy mushroom sauce. Another delicious dish was the old-style Hainanese chicken rice balls – this is poached chicken served with rice balls cooked in the chicken’s own broth. I love this dish and have seen a few variations on it in Malaysia and Singapore. The fried chicken wings, another Hainanese classic, was also a popular dish – crispy and very meaty, I just wished we had ordered a few more servings of these bad boys. After a short but pleasurable stay at The Majestic Hotel Kuala Lumpur, it was time to say goodbye and leave for our next destination: Pangkor Laut Resort. Pangkor Laut Resort and I are no strangers – I was lucky enough to visit this resort a couple of years ago (reviewed here), and fall in love with it. Returning to Pangkor Laut was a tad scary – would it live up to the wonderful experience I’d had? Located on a small private island three miles off the West Coast of Malaysia along the Straits of Malacca, Pangkor Laut Resort is reached from the much larger Pangkor Island, where guests check in at the jetty before being whisked away by speedboat for a 15-minute ride. Stepping off the launch onto the impressive pier, an army of staff welcomes guests with ice-cold drinks and towels, taking care of the luggage and helping with the check-in and orientation. Over the years, Pangkor Laut Resort has been awarded many accolades including the "Number One in the World" by Condé Nast, as well as being voted the world's best spa resort by the readers of Travel & Leisure World. There is only one resort on the island, no other hotels, restaurants or businesses. Of the island's 300 acres, only a small part has been developed to house the resort, leaving plenty of beaches and natural rainforest (which still makes up 80% of the island) to explore. The resort offers various types of accommodation including the Spa Villas where we stayed, next to the spa, built on stilts over the sea. Spacious, elegant and stylish, they offer great privacy, and are fully equipped with a king-size bed, a massive stone bath, air conditioning and a stunning veranda over the sea. These rooms are mainly used by couples, and no children are allowed in the Spa Villas or Village. I loved my room - beautifully decorated, and very spacious. Alternative accommodation is available further inland at the nearby Sea Villas (also on stilts but closer to the resort's main reception and restaurants), and also the Beach, Garden and Hill Villas respectively, which are built on solid ground. These are aimed more at families than couples, and include television and Wifi. Also, these rooms are closer to the forest, and to the main reception, restaurants, bars and tennis courts. There are six dining locations in the resort; they vary in cuisine and formality, including Chinese, Malay, Indian, French fine dining and Japanese options. In my opinion, the best meal of the day was breakfast at Feast Village, which was outstandingly good. There was a variety of stations serving individually prepared Malay, Chinese and Western dishes, including Dim Sum, Teppanyaki Noodles, Nasi Lemak, freshly baked waffles, fresh tropical fruits of every shape and size, as well as juices, cereals and French pastries. The sheer variety of dishes and styles makes for a very long breakfast if you want to try a bit of everything, which I highly recommend, so make enough time for it. Next to Feast Village, The Straits Restaurant is set against the rocks by the beach, and is lined with dining booths that overlook the sea, a really stunning setting. This is where we had our first dinner soon after arriving at Pangkor Laut. The restaurant serves a selection of fine South-East Asian dishes. Uncle Lim's Kitchen was built on top of a rock surrounded by fig trees, and is named after the chef who has been with the resort since it first opened. It specialises in Nyonya and Hockchew Chinese-style home cooking, and it was here that we had one of the best meals on this trip. Uncle Lim himself was there to greet us and cook a number of outstanding dishes including stir-fried scallops and fine green beans in a spicy sauce, sautéed lobster and deep-fried tofu and abalone, to name just a few. Uncle Lim’s Kitchen was my preferred restaurant during my first visit to the resort and it continues to be in my opinion, the best dining option at Pangkor Laut. Following a fascinating Jungle Walk guided by the resort’s resident naturalist, ending at Emerald Bay, we headed to Chapman’s Bar for a "Banana Leaf" lunch. The Chapman's Bar is named after a famous British Colonel who, after more than three years evading Japanese soldiers in the jungles of mainland Malaya, sought refuge at Emerald Bay before escaping to a British submarine just outside the bay in 1945. By sheer coincidence, one of my good friends in London is William Chapman of 7 BR Chambers is his great nephew, and he explained that after the war his Uncle Freddie had a distinguished career in education, but sadly died in 1971 by his own hand. The food at Chapman’s Bar was South-Asian, and quite varied including a selection of curried vegetables (ladies fingers, fine green beans, cabbage and rice), beautifully seasoned meats and fresh fish and seafood served on banana leaves. The food was delicious and some of the best we had on the island. It is open for light lunches and more formal dinners on the beach. The Royal Bay Beach Club is another great spot for lunch. Situated by the resort’s largest swimming pool and fitness centre, this is an open air restaurant and a favourite option for families. I had a delicious Chicken Kapitan there, a classic Nyonya dish, that was bursting with flavour. But what to do between meals at Pangkor Laut? Fear not, there are many activities to get stuck into - from putting your feat up on the beach or relaxing at the resort’s award winning spa to jungle walking and excursions to Pangkor Island, sunset cruises, cookery and yoga classes, there isn’t a dull moment to be had at the resort. At the top of my list of things to do is a signature spa experience at the resort’s award winning Spa Village, that takes a full 3 hours. This involved a pre-treatment bath-house ritual of washing and scrubbing, including a Japanese onsen-type experience and herbal steam inhalation. Once clean and very shiny, I had a 2-hour massage known as Campur-Campur, which blended Malay and Thai techniques, pressure points and aromatherapy. I've been to a few hotel spas in my time, but the one at Pangkor Laut was quite something. Covering about an acre of land, it has a very peaceful quality, being mostly in the open air, surrounded by running water and with the sound of the sea audible throughout. I remember falling asleep and waking a number of times during the massage, and when it was over I was so relaxed that I could not get up from the table! I highly recommend a visit to the Pangkor Laut Resort’s spa. 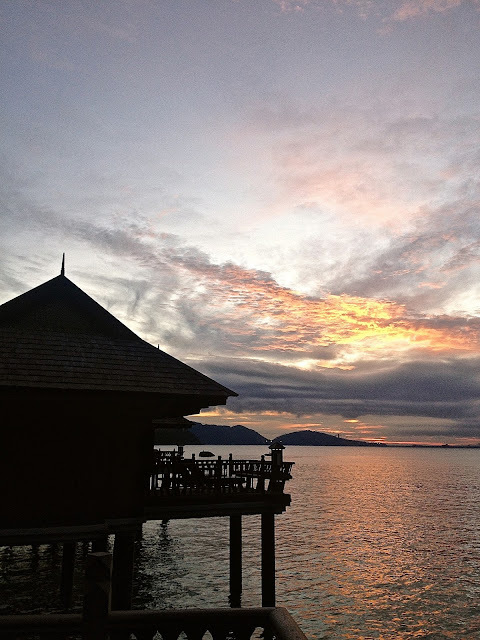 The resort also provides excursions to the nearby Pangkor Island. We visited the island’s fishery as well as one of its major fishmongers, and it was amazing to see the volume of fish being handled and boxed away for shipping to all corners of the world. We also visited a dried seafood market and watched local women preparing the dried fish to be sold, as well as visiting the resort’s noodle maker on Pangkor Island. These visits gave us a fascinating glimpse into the islanders everyday lives. Back at the hotel, we headed to Feast Village for the Chef's Kitchen Experience. As a chef, this was one of the most interesting activities at the resort. Chef Ken (our Malay chef) taught us how to cook some fantastic local dishes including Ikan Bilis - a snack of dried baby anchovies and peanuts, fried in a sweet, sour and spicy onion dressing that was truly delicious. Another great dish was Chef Ken’s deep fried prawns served on a bed of julienne apples that was both refreshing and moreish. Having prepared these dishes, the experience then included an hour's massage at the Spa Village. A wonderful way to spend a day of cooking at the island! My return visit to Pangkor Laut only reinforced my feelings towards this fascinating resort, I felt that the top luxury resort of Malaysia has only improved with time and better acquaintance! And I am already contemplating a 3rd visit….